Hello again from your online Thai Supermarket. Today we feature a simple special offer on the best Thai oyster sauce, and new arrivals on Thai and Japanese hand crafted knives. We also feature a older barbecue recipe that will be enhanced next week with an update. Thanks for visiting! 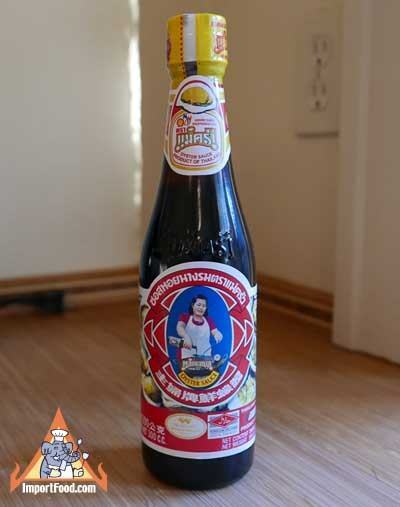 We just got a fresh shipment of Mae Krua, with Best By date through 2019. It's just the best oyster sauce. We love to marinate steak with plenty of oyster sauce, a handful of crushed garlic cloves and a little bit of fish sauce. NEW: Hand Crafted Santoku Knife, Blue Steel, 12.5"
Limited Edition santoku entirely made by hand, with 'Stingray Tip' stamped in Japanese on the blade. Exclusively made in small batches by a master craftsman who takes prides in perfect design and blade material. We will offer more from this maker in the future, in various traditional styles. Blue Steel is extremely hard and ideal for making knives that stay sharp with months of contant use. This comes with a true Japanese magnolia handle. SEE: Hand Crafted Santoku Knife, Blue Steel, 12.5"
NEW: Hand Crafted Office Knife, Chestnut Handle, 10.5"
The blade is 5.5" long, and handle is 5" long. Total length 10.5". The chestnut handle is round except for one slight ridge perfectly located on the upper right (as shown). This feels excellent in the hand and is popular with Japanese and western chefs. SEE: Hand Crafted Office Knife, Chestnut Handle, 10.5"
Hand Crafted Nakiri Knife, Sakai Japan, 15"
SEE: Hand Crafted Nakiri Knife, Sakai Japan, 15"
Order in advance. Shipping to you from our shop late March 2018. Designed specifically for pork vendors, and most every pork vendor in Thailand uses this knife. Very sturdy blade, slightly thicker than 1mm. Nice wood handle. Total length is 11", the blade is 6.5". Made in Thailand. A relatively thick and beautifully designed knife with a great name "Mete Dun Pa" which translates as "walk in jungle knife". Ready for action if a wild boar comes your way. The blade is 3/16" thick. Cut, pounded, shaped, sharpened and finished by hand. Very delicous, authentic Thai green curry made in Thailand by Aroy-D, known for premium quality curry paste products, which are used by many restaurants around the world. We just received a new shipment, this has been out of stock for several months. This is an old recipe we featured years ago, and we will update next week with a similar version using oyster sauce and garlic. This recipe uses Thai and Indonesian ingredients, the results are fantastic. Just four ingredients make up the sauce, so this is a very simple recipe!